"The Little Shop of Horrors"
We have always loved “The Little Shop of Horrors” musical, and thought it was fun, and definitely appropriate for Halloween. We thought it would be really cool to try to recreate these classic characters. Everybody better beware! The Little Shop of Horrors is open for business. Gryphon is playing the part of Seymour, the young florist shop clerk who stumbles upon a very unusual plant, which he names Audrey II. Phoenix plays Audrey II, the man eating plant from outer space who is out for blood. Seymour is feeding drops of blood from his finger into Audrey II's gaping toothy mouth. This causes the plant to grow and grow, and it's tendrils continue to spread until they are taking over the florist shop, and just might take over the world. 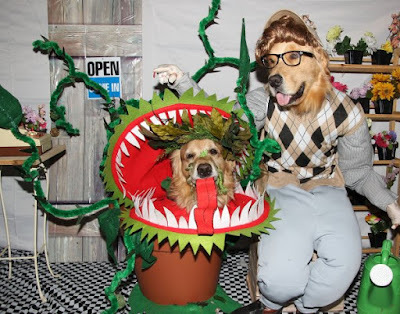 The Audrey II costume was definitely the most challenging. We obtained a used plant costume headpiece that was intended for a human, and altered it to fit a dog. We cut off the neck part, and wired it together to make it the right shape. We also added teeth, which we cut out of white stiff felt and glued along the rim of the mouth with a glue gun. We wanted Phoenix to really have that plant look, and be inside a pot. We found a large old gardening pot, and cut out the bottom. That way it was able to fit over Phoenix’s head. We then created tentacles and vines to make the plant look like it was growing everywhere. We made the vines out of green jumbo chenille stems, with leaves made from felt shapes with wire glued inside. We arranged some of the vines to look the plant’s hands, sticking out from each side. We also added a leafy headpiece made of branches and synthetic leaves. We completed the Audrey II look with a long tongue made from red felt, which we stiffened with fabric stiffener and curled around cups to give it that shape. We glued this to a wooden stick, so Phoenix could easily hold it in his mouth. For the Seymour costume, we collected old pieces of clothing to form his outfit. We used an argyle sweater vest, a men’s button down shirt, and some grey pants. We stuffed the clothing where necessary, particularly the shoulders, arms, and legs with stuffing, to give it shape and the look of a human. We attached tan gloves onto the ends of the arms, which were also stuffed. We found a pair of our old boots, to be the shoes. We then attached all these pieces together, with the pants attached to the front side of the shirt, so the pants would dangle in front of the dog and look real. We added some band-aids and bandages to the fingers on the gloves, to make it look like Seymour had been feeding Audrey with blood. We even created blood dripping by making droplets with the glue gun, and coloring them red after they dried with a permanent marker. We completed Seymour’s outfit with a tan baseball cap, short wig, and black rimmed glasses. We thought the costumes came out pretty good, and they made a fun and spooky pair! Copyright © 2015 by Bonnie and Beth A. All rights reserved.